Wow Vintage, should open up a thread on this topic, i too have visited lots of historical places in England and France, i love them. 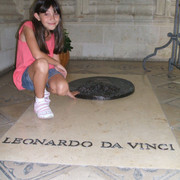 below is an old picture i took of my daughter posing on the grave stone of leonardo da vinci. Sorry to, this is my last hijack on this thread.